The Brinton’s 14th Illustrator Show takes on a new form with the 2019 exhibit featuring American Indian art on the Lakota Emergence narrative, How the Lakota Came Upon the World which was recorded by James Walker sometime between 1896 and 1917. 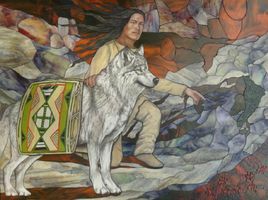 Sixteen distinguished or emerging Lakota artists were invited to create works of art to illustrate the Lakota narrative. This exhibit is originated by CAIRNS, The Center for American Indian Research and Native Studies. A selection of American Indian artifacts from The Brinton’s permanent collection will also be on display to accompany this exhibition. Exhibit Curator Craig Howe, Ph.D., will be in residence at The Brinton for school tours the week of April 1st. Craig is a member of The Brinton Museum’s American Indian Advisory Council and the founding director of CAIRNS, as well as the former director of D’Arcy McNickle Center for American Indian History at the Newberry Library in Chicago. A reception for the public takes place on Sunday, March 31st from 3 pm to 5 pm. Students and teachers are offered free admission to museum exhibits and programs. Craig Howe will present a Gallery Talk, open to the public, on Tuesday, April 2nd.